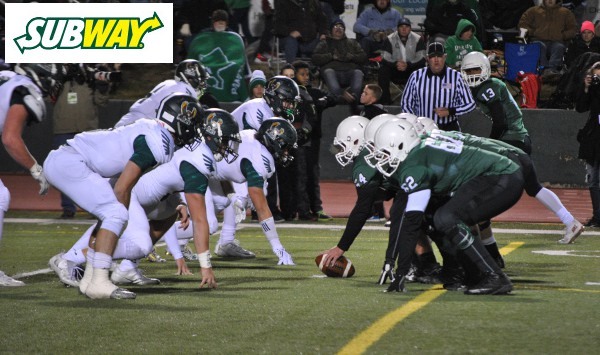 On this Friday Playoff edition of the Subway Fresh Take, we’ll recap semifinal playoff action from the 11-Man classes. Blue Valley 35, Shawnee Mission East 34 – Blue Valley advanced back to the 6A state championship game with a dramatic 35-34 overtime win over Shawnee Mission East. Quarterback Matthew Dercher tossed 10-yard touchdown pass to Harrison Van Dyne to pull the Tigers within 34-33. Coach Eric Driskell decided to go for the two-point conversion and the win. Dercher hit Blake Brown on the two-point conversion for the win. Shawnee Mission East got the ball first in overtime and scored on a Milton Braasch touchdown run. The Lancers trailed 27-19 in the fourth quarter, but scored on a 13-yard Nigil Houston touchdown run with a minute remaining. Trevor Thompson added the two-point conversion to force overtime. After the Lancers took a 6-0 lead, Blue Valley scored on a touchdown run and a touchdown catch by Williams Evans to lead 13-6 at the half. The Lancers scored early in the third quarter to tie the game, and forced a Blue Valley punt shortly after. Dercher’s quick kick was downed at the on the 1-yard line and Shawnee Mission East fumbled on the next play leading to a Tiger touchdown. East pulled within 20-19 mid-way through the third quarter, but Blue Valley took a 27-19 lead on a Dercher to Cade Green touchdown pass less than a minute later. Derby 49, Lawrence Free State 21 – The Panthers briefly trailed early and then rolled over Free State, 49-21, in a rematch of last year’s sub-state game. Derby (12-0) is the defending 6A state champion and will match up against Blue Valley again in the finals after a 27-14 win last season. Derby has won 22 straight contests, Kansas’ longest current winning streak. Free State had issues with field position all night, and Derby scored 35 straight points after trailing 7-0. Dan Dawdy and his trio of standout wide receivers – Michael Littleton, Kai Lemons and Kenyon Tabor – all had big games. Dawdy completed his first 11 attempts and finished with three touchdown passes and one rushing. He completed 21 of 28 passes for 343 yards. Tabor had 166 receiving yards, Littleton 110 with a score and Lemons 67 for two touchdowns. Free State finished 9-3. Mill Valley 14, St. Thomas Aquinas 14 – Defending Class 5A champion Mill Valley punched their ticket back to Pittsburg with a 14-13 win over St. Thomas Aquinas. The Jags forced five Aquinas turnovers in pulling out the one-point win. Trailing 14-13 with 1:30 remaining in the fourth quarter, Aquinas fumbled at the Mill Valley 2-yard line. Mill Valley lined up to punt in the end zone with a minute left, but Aquinas was called for roughing the punter giving the Jags a first down. The Jags led 14-7 in the fourth quarter when Matthew Roberts pulled the Saints to within one with 10 minutes left, but the PAT failed. Goddard 50, Great Bend 21 – The Lions continued to deliver big playoff wins and won at Great Bend, 50-21, and advanced to its second state championship game, first since earning runner-up in 1988. Goddard (11-1) scored on the game’s second play and delivered 462 yards in a rout against the 10-2 Panthers. Senior Kody Gonzalez rushed for 139 yards, while Blake Sullivan passed for 112 and rushed for 99. Goddard led 28-7 at halftime. The Panthers, which struggled some in rushing offense down the stretch, tallied 108 yards on the ground. Goddard, the No. 4 seed on the west, has defeated No. 5 Bishop Carroll, No. 1 Wichita Heights and No. 2 Great Bend in the last three weeks. Early, Great Bend had a key play when quarterback Jacob Murray was headed for a score but fumbled at the Lion 2-yard line. Great Bend later scored after a Goddard punt and cut the deficit to 20-7. Bishop Miege 52, Basehor-Linwood 0 – Landry Weber scored three first-half touchdowns as Bishop Miege built a 38-0 lead en route to a 52-0 win over Basehor-Linwood. The two-time defending 4A-I champions already led 7-0 before Weber returned a punt for a touchdown and a 13-0 lead. Weber then caught a 22-yard touchdown pass from Carter Putz to push the lead to 20-0. Putz then hit Jafar Armstrong on a touchdown pass to make it 26-0, followed by a Brison Cobbins 5-yard run. Weber then caught a 57-yard touchdown pass for the 38-0 halftime lead. Armstrong returned the second-half kickoff for a touchdown and Cobbins added another touchdown to complete the Miege scoring. Buhler 27, Maize South 7 – The Crusaders defeated Maize South for the second time this season in a 27-7 victory and moved into the Class 4A, Division I state championship game. Buhler limited the Mavericks to 102 total yards. Dalton Brown had another big game with 34 carries for 155 yards and a score. Buhler (11-1) is in the title game for the first time since 2013 when it finished undefeated and won the 4A title. That season and a runner-up showing in ’90 are the program’s two state berths before this year. Maize South (10-2) was playing in its first semifinal in its short school history. Maize South had no first downs until there were 15 seconds left in the first half, and Buhler led 17-0. The Mavericks’ lone score came on a fumble recovery that gave Maize South the ball at the Buhler 4-yard line. Buhler defeated Maize South, 21-14, in Week 4. Topeka Hayden 20, Holton 8 – Hayden beat Holton for a second time this season and advanced to the 4A-II state title game next week. The Wildcats jumped out to a 14-0 lead in the first quarter with a Tomas Stringer 8-yard run and a touchdown pass from Sampson Huston to DeShawn Hanika. Holton pulled to within 14-8 on a long touchdown Miles McClintock-Strozier touchdown run. It remained a one-score game until Stringer scored on a 15-yard run in the third quart to push the Hayden lead to 20-8. Hayden rushed for more than 330 yards in the game led by Stringer’s 105 yards. Pratt 21, Holcomb 14 – The Greenbacks beat the defending state champion Longhorns for the second time this season. In district play, Pratt beat Holcomb, 35-28. Pratt, unranked in the preseason, is in its second state title game, first since winning the crown in 1995. Pratt recovered a fumble and then broke a 14-14 game with a 21-yard pass from Landen Studer to Hunter Kaufman with 2:49 remaining. Then, Pratt recovered a Holcomb fumble with 2:22 remaining to essentially seal the win. The Greenbacks had previously tied the game at 14 on an 11-yard scoring run from Hunter Kaufman. Pratt took an early 7-0 lead on a 27-yard pass from running back Travis Theis to Kaufman on 3rd and 18. The Longhorns’ Michael Roth blocked a field goal just before half. After a Pratt interception, Holcomb scored in the second half but missed the extra point and trailed, 7-6. The Longhorns took the lead on a 27-yard touchdown run. Pratt moved to 11-1, while Holcomb finished 10-2. Rossville 27, Nemaha Central 22 – Jacob Bradshaw broke a 64-yard touchdown run mid-way though the fourth quarter to propel Rossville to the 3A state championship game for the third consecutive season. The Bulldawgs took a 21-14 lead into halftime on a Dawson Hammes touchdown run. Nemaha Central took a 22-21 lead in the third quarter on Mitchell Henry’s second touchdown run of the game. Bradshaw rushed for 128 yards and passed for 108 yards and two touchdowns. Cole Schumacher caught five passes for 77 yards and two scores. The Thunder rushed for 235 yards in the game led by Henry’s 93 yards. Hesston 35, Hoisington 19 – Hesston continued its surprise run through the Class 3A bracket with a 35-19 home victory versus Hoisington, undefeated and ranked No. 1 virtually all season. Hesston, which hasn’t lost since a 1-3 start, is into its first state title game since the school’s lone crown in ’92 and third in school annals. Zach Vogt caught eight passes for 156 yards as Hoisington struggled with Hesston’s read option in pass defense. Hesston didn’t lose at home this year and hasn’t lost since a 1-3 start with three close losses. The Swathers never punted and quarterback Zach Esau finished 13 of 17 for 227 yards and a score. He also rushed 12 times for 47 yards and a pair of scores. Hesston led 14-0 at the end of the first quarter and all the scoring occurred in the first three quarters. Hoisington again missed Hunter Hanzlick, the team’s all-time leading rusher, due to an elbow injury suffered in the second round of the playoffs. Sean Urban led the Cardinals with 169 rushing yards, but Hesston limited explosive Cam Davis to 13 carries for 66 yards. Hoisington finished 12-1, and Hesston is 10-3. Troy 28, St. Mary’s Colgan 0 – The Troy Trojans punched their return ticket to the Class 2-1A state championship game in Hays by shutting out St. Mary’s Colgan, 28-0. An errant Colgan snap resulted in a safety to get the Trojans on the board after a scoreless first quarter. Shortly after, Cuttar Huss broke a 35-yard touchdown run and Alex Martinez scored on a short run for a 15-0 halftime lead. Martinez and Connor McNorton added touchdown runs in the second half to put the game away. Troy’s defense was dominant in holding Colgan to 65 yards of total offense. Colgan senior quarterback Billy Dickey left the game with an apparent non-contact knee injury in the first quarter and did not return. Martinez led Troy with 76 rushing yards, while Huss and McNorton added 64 and 63 yards, respectively. Quarterback Reid Greaser threw for 150 yards to lead the balanced Trojan attack. Plainville 14, Smith Center 0 – The Cardinals defeated Mid-Continent League foe Smith Center for the second time this season and moved into their first state championship game since 1985 with a 14-0 home victory. Plainville, 3-6 each of the last two years, climbed to 11-1 this season under second-year coach Grant Stephenson. Plainville had beaten Smith Center, 20-16, in the season opener, also at home. Smith Center finished 9-3 and lost in the sub-state championship game for the second straight year. Both touchdowns came in the first quarter on senior quarterback Hayden Friend runs of 60 and one yard. After Smith Center punted on the opening possession, Friend quickly tallied his long run for a 7-0 lead. Following a second Redmen punt, Plainville had a 10-play, 85-yard drive that culminated on Friend’s second score. Cardinal senior Riley Nyp hurt his ankle on the drive and missed some time but did return. Both teams had chances throughout the contest, including Plainville having a short field off a blocked punt by freshman standout Jared Casey in the second quarter. On another drive, the Cardinals ended the first half at the Redmen 20-yard line. In the third quarter, Smith Center missed on 4th-and-inches from the Plainville 19-yard line. The Redmen intercepted Friend with 3:52 left in the contest, but Cardinal junior Hayden Gillum picked off a pass two plays later.